Welcome to Green Acres Pool Place, your family-owned and operated pool and hot tub builder, service and retail provider, serving Cartersville, Rome, Acworth and the surrounding areas since 1974. At Green Acres Pool Place, we take pride in providing quality inground swimming pool construction, reliable swimming pool service and maintenance, and exceptional customer service. 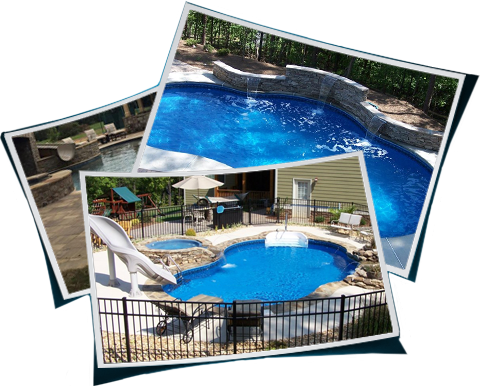 Green Acres Pool Place specializes in the construction of custom inground gunite swimming pools, vinyl liner swimming pools and fiberglass swimming pools. Whether you’re looking for an elaborate backyard design or are wanting to keep things traditional, we can help create the perfect outdoor poolscape to meet both your needs and budget. We also carry a large selection of above ground swimming pools from today’s top manufacturers for those families looking to incorporate a more portable, economically-friendly option into their backyard. We don’t stop at just the pool. Let our design specialists complement your new poolscape with a custom outdoor living space, complete with a fire pit, fireplace or beautiful pavers. We’re dedicated to creating a space where you can enjoy quality time with family and friends for years to come, and we look forward to bringing your backyard vision to life. Once your pool is complete, let the professionals at Green Acres Pool Place handle all your poolcare needs. From regular service and maintenance to scheduled cleanings to equipment repair and more, we can do it all, including vinyl liner installations. Our well-trained and knowledgeable service technicians are ready to care for your pool as if it were their own. Our retail store is also home to a variety of the best pool and hot tub chemicals on the market today. We’re dedicated to ensuring that your pool operates at its most efficient with crystal clear water. We carry a large selection of pool, spa and outdoor living accessories, including chemicals, toys, games, equipment, replacement parts, and much more. Stop by our Carterville location today to learn more about Green Acres Pool Place and how we can help you, or give us a call to schedule your at-home design consultation. Come to Green Acres Pool Place to build your dream pool! Our experienced crew uses only the best materials on the market, guaranteeing your backyard oasis to last for years to come. Green Acres Pool Place provides our customers with the prime choices for above ground pools: Evolution and Eclipse. Call us to schedule a professional pool installation and start swimming in your new pool! Choose from our beautiful selection of vinyl liner patterns and have the experienced experts at Green Acres Pool Place install or replace your pool’s vinyl liner, wrinkle-free guaranteed. Our design specialists are well-versed in today’s outdoor living trends. So whether you’re looking to incorporate a fire pit or fireplace in your backyard, or premium pavers in your poolscape, you’re in good hands. Green Acres Pools strives to ensure customer satisfaction in each and every project we undertake. We invite you to browse through our galleries and see the expert craftsmanship we can bring to your backyard.